Toyota’s new entry level car may be a little funny looking, with a funny name and, at least in Canada, a bizarre “Uncle Yaris” ad campaign the designer of which should be sacked, but that doesn’t prevent the little bugger from being far more fun to drive than you’d think it has any right to be. Yaris, which I speculate may be Japanese for “roly poly little blob on wheels,” is the successor for the ordinary and dumpy-looking – though successful – Echo hatchback (I’m surprised not to hear that Echo coming back!). And what Toyota has come up with is a nifty little car that’s practical, economical and even kind of attractive in a globular type of way. It kind of looks like an Echo with the frumpiness ironed out to leave clean and aerodynamic lines. The result is cute. The car is a straightforward front engine, front wheel drive vehicle, available in either three or five door (read two door or four door hatchback) versions. I had the five door and was amazed at just how roomy it was inside – hatch space not included. Under the hatch the real estate is darn tight (remember, though, that this is a very small car! 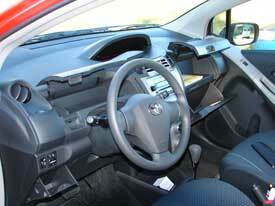 ), but the rear seat folds down to help mitigate the circumstance. The result is decent, though not earth shattering, hauling room. The overall package reminds me of the 1976 Honda Civic my wife and I had in 1976. It was a great car, with plenty of room for a young couple (even with a couple of ankle biters) and it was also quite a bit of fun to drive. The Yaris takes everything I loved about that old Honda, and brings it up to date without sending it seriously up market like where the real Civic (and the Corolla and others) have gone. When I first picked up the Yaris, my impression was something like “Geez, a week in a cheesy little subcompact.” But it didn’t take long for Uncle Yaris to win me over. It may be a subcompact, but it certainly doesn’t come across as substandard. The Yaris comes from Toyota's European design studio, and the company says it’s the first vehicle sold in Canada to be created entirely using Toyota’s “Vibrant Clarity design principles.” This is Toyota speak for the design’s “energy and innovative character” and its “rationality.” Yaris is a new look, but it’s recognizable as a Toyota not only because there’s a more than superficial resemblance to the Echo, but because of course it also displays Toyota’s “big pretzel” logo prominently on both ends. The car’s lines flow athletically, and even a bit gracefully for something that looks overall like a jelly bean honed in a wind tunnel. The wheels are close to the corners, which helps maximize interior room and handling. Inside there is, indeed, plenty of room. 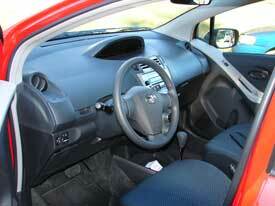 And the interior itself, while clean and uncluttered, is interesting on one hand and annoying on the other. The center instrument cluster is laid out in an interesting and vertical layout and the instrument panel is placed in an annoying center location that forces you to take your eyes off the road and swing them over to the middle of the car if you care about knowing such things as your speed and engine rpms. On the other hand, if you listen to the song of the Yaris you can get a good feel for the revs, and if you don’t care about speeding tickets you can also ignore that horribly placed pod. I’ve heard mumbo jumbo about how putting the panel amidships is actually beneficial, but I don’t believe it for a minute. I could probably get used to it where it is, but that doesn’t mean I’ll grow to love it (stick in the mud that I am) and over my week in the Yaris I grew to hate it so much it would cause me to have second thoughts about owning one regardless of how much I enjoyed the rest of the Yaris experience. The interior is comfortable and it’s easy to find a nice driving position. Controls (not including instruments) are easy to reach and use, and the stereo cranks out decent sound quality and volume. I found the power window controls too far away for my taste, but that’s pretty minor. And despite the relatively small hatch, there’s a surprising amount of other storage space, as well as a wide variety of storage bins, all over the interior. 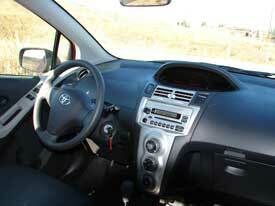 There’s plenty of customization and optional equipment you can shoehorn into the Yaris as well, both inside and out. Variable Valve Timing with Intelligence ( VVT-i), sequential multiport electronic fuel injection engine that qualifies the little beastie as an Ultra Low Emissions (ULEV2) Vehicle. To call it peppy is to bring back to life an anachronistic marketing term for four bangers in years past – though it’s also accurate. Horsepower is 106 @ 6000 rpm and torque is 103 lb. ft @ 4200 rpm – not huge ratings by any means but more than adequate for this little critter’s small size and light weight. The power plant is mated to either a 5 speed manual or a four speed automatic. My test Yaris was saddled with the slushbox, which helped lead to my initial unease about the car, but I was surprised to find that it shifts well and doesn’t scrub all the fun from the experience. Suspension up front consists of Macpherson gas struts, coil springs, and a stabilizer bar. Uncle Yaris keeps his bum slung by using a torsion beam-type suspension with coil springs. It all works fine and, dare I say, it even tempts one to let the latent boy racer inside one rise at least part way to the surface. Okay, you aren’t going to blow any Corvettes away, but you’ll have fun losing to them. Brakes are power assisted discs up front, with drums slowing the rear wheels. ABS and Electronic Brake Force Distribution is added as standard equipment to the RS trim level (it’s optional on the base model). Base Yarises (Yari?) come with 14 inch wheels wearing P175/65R14 all seasons; the “high end” model sports 15 inchers equipped with P185/60R15 all season tires. The spare is of the compact type. 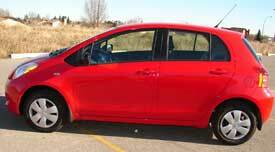 Toyota claims the Yaris gets 41/51 miles per gallon with the manual transmission and 40/49 with the slushbox. I never get anywhere close to the published figures, but only used about half a tank during my week of relatively spirited urban driving, which I would classify as more than acceptable. The Yaris has been on sale in Europe and Japan for a while now, and Toyota says it’s aimed at “style-conscious, younger urban buyers.” This means that once again we baby boomers are shut out of the corporate thinking. I guess we’re all supposed to buy Camrys or Lexi, not that there’s anything wrong with that! But I can think if many good reasons for a crusty middle aged fart like me to choose a Yaris if all you’re looking for is a good commuter vehicle with which to zip around the city; it would also make a heckuva second car, or a great vehicle to haul behind one of those behemoth RV’s you see all the time. Heck, I might even consider a Yaris as a replacement for our aging Corolla. 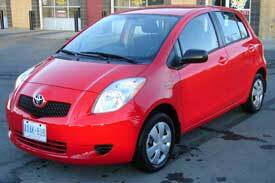 And I’d definitely look at Uncle Yaris before the goofy-looking and truncated SMART car – and save a few grand in the process. Toyota lists its MSRP for the 3-door Yaris with manual transmission at $13,580 (rising to $16,880 for the 3-door Yaris RS). 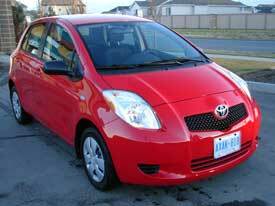 The 5-door Yaris LE starts at $14,910 and climbs to $17,615 (all figures in Canadian dollars). This seems quite reasonable to me. For comparison, the so-called SMART fortwo, which is only a two seater, starts at $16,700 Canadian. I was surprised how much I enjoyed driving the Toyota Yaris. It doesn’t pretend to be much more than an entry level car, but for an entry level car it’s a lot more rewarding than one might expect. And because it’s a Toyota it will probably run forever and be affordable to drive from now until Uncle Yaris is finally consigned to an old folks home. I think Toyota may have a winner here.